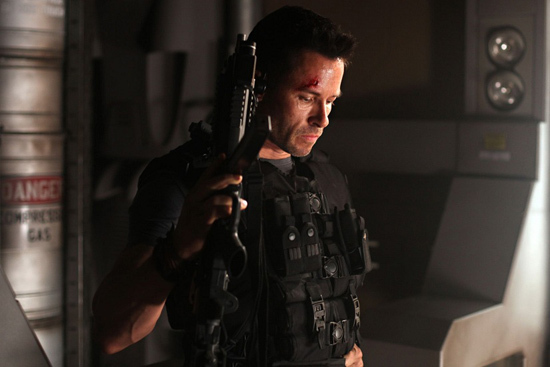 Check Out Five Minutes of Guy Pearce's Sci-Fi Space Thriller 'LOCKOUT'! A 5-minute clip from the Guy Pearce starring sci-fi flick Lockout was debuted at WonderCon yesterday. The movie, directed by James Mather & Stephen St. Leger arrives this April 20th & also stars Maggie Grace & Peter Stormare. The clip highlights a scene involving Pearce‘s character breaking into a space prison. Pearce plays a wrongly-accused spy who must rescue the President’s daughter [Maggie Grace] from the orbiting prison. Hit the jump for the details. Synopsis: "Starring Guy Pearce and Maggie Grace and set in the near future, LOCKOUT follows a falsely convicted ex- government agent (Pearce), whose one chance at obtaining freedom lies in the dangerous mission of rescuing the President’s daughter (Grace) from rioting convicts at an outer space maximum security prison." I'm reading: Check Out Five Minutes of Guy Pearce's Sci-Fi Space Thriller 'LOCKOUT'!Tweet this!